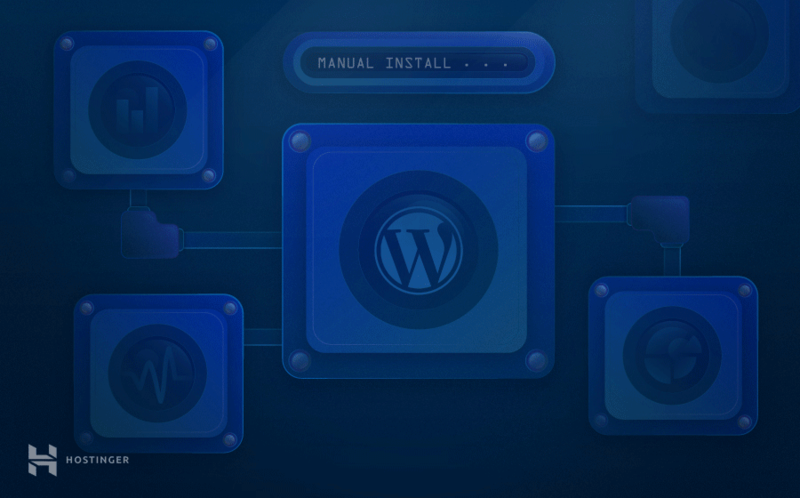 Install WordPress on various platforms using our guide! We will show you how to perform a WordPress installation on shared hosting, VPS, and a local Mac or Windows machine. WordPress is a free open source software, which you can install on your hosting account. Webmasters use WordPress to create any kind of websites. From simple blogs to complex e-commerce websites – anything can be built using WordPress. Due to its simplicity and versatility, WordPress has become one of the most popular CMS. Effortless installation is another reason why WordPress is so popular. Upload WordPress files to your hosting account. Create MySQL database and assign user for it. Complete WordPress configuration using 5-minute install wizard. That would be manual way to setup WordPress. It’s worth to mention that, many premium web hosting companies like Hostinger have an option to install WordPress by using auto installers. It literally takes just a few mouse clicks to have WordPress up and running on your hosting account. If you’ve decided to create a WordPress website, this tutorial is for you. You will learn how to install WordPress by using auto installers as well as how to manually install WordPress with the famous 5-minute WordPress installer. Access Hostinger control panel and click on Auto Installer icon. 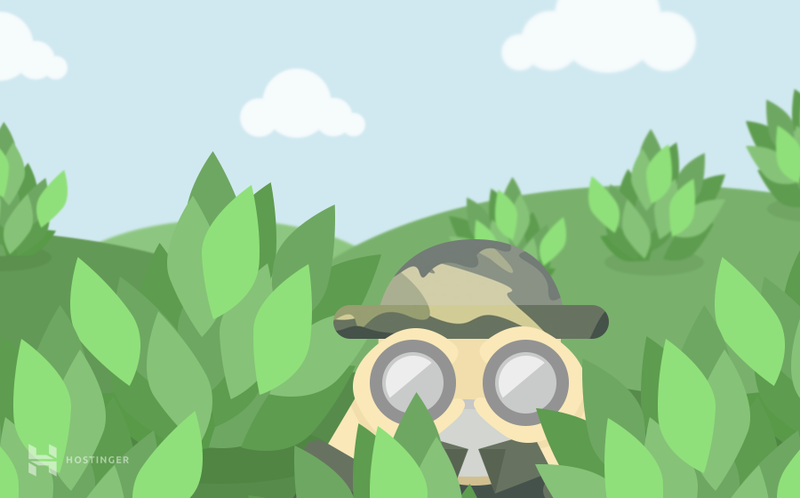 Enter WordPress in the search field. You will be presented with the latest version of WordPress. Click on it. URL – Address of your WordPress website. Leave it blank if you want to setup WordPress on domain name root. Administrator Username – You’ll have to use this username to log in to WordPress dashboard. Administrator Password – The password you’ll have to enter to log in to WordPress admin area. Administrator Email – Your email address. It’s recommended to enter a working email address here, as it’ll be used for notifications and password reset. Website Title – Your WordPress website title. Website Tagline – Your website slogan, used to explain what website is about. And that’s it! You can now log in to the administrator dashboard and begin creating your website. Use FTP client to upload WordPress files to a hosting account. Open your domain in the web browser and run the WordPress 5-minute installation wizard. Firstly, download the latest version of WordPress. WordPress installation files are compressed in the .zip archive. Extract the archive to any folder on your computer. You’ll end up with a folder named WordPress. This folder contains WordPress installation files. 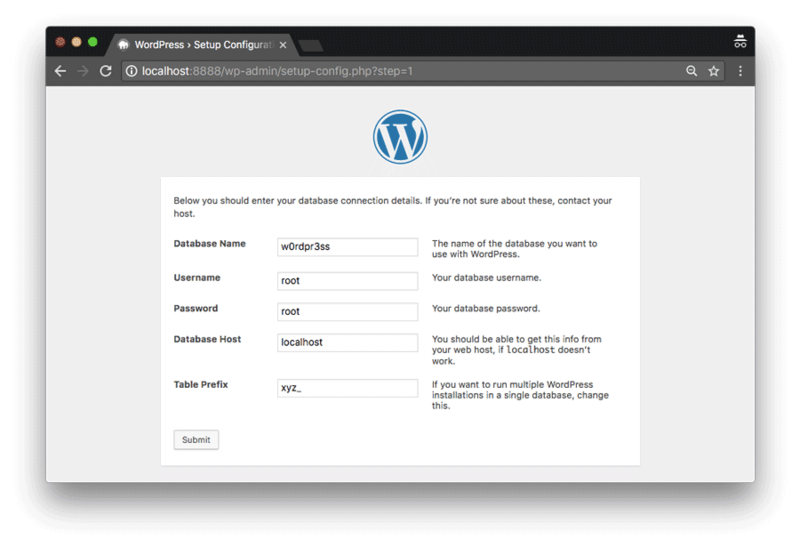 Secondly, upload the extracted WordPress files to a hosting account. There are quite a few ways to do this, but the most convenient way is by using FTP. At Hostinger, FTP details can be found in FTP Access section. If you need help with connecting to FTP, see this tutorial. Open wordpress folder in your FTP client and upload all files from it to the hosting account. NOTE: We are using File Zilla to upload files, but you can use any other FTP client. WordPress generates content dynamically every time visitor enters the website. All information is stored in the database. Thus, you’ll need to create one. IMPORTANT: Be sure to write down MySQL credentials – you will need them later. At this step all WordPress files should be uploaded to the server and MySQL database should be created. Now you can proceed with the installation wizard. Access it by opening your domain name with a web browser. Select your language and press Continue. WordPress will ask to collect MySQL details. Since you already have them, press Let’s go! button. On this screen enter your MySQL database credentials and MySQL hostname. You can check what your hostname is in Hostinger Members area -> MySQL Databases section. Press Submit button once you are done. WordPress will check whether it’s possible to connect to MySQL database. If there are no errors, press Run the install. Site Title – Your website title. Your Email – Administrator email address. Search Engine Visibility – If you check this option, WordPress will try to prevent search engines from crawling your website. That’s it, WordPress installation has been completed. Press Login button to access the WP admin area. If your hosting provider uses cPanel for account management – this part of the tutorial is for you. Below you will find 2 different ways to setup WordPress on cPanel based hosting. Because of its easy installation and maintenance, Softaculous is a popular auto installer on hosting providers who use cPanel. With Softaculous you can install a handful of different CMS and Apps with just a few mouse clicks. After accessing cPanel, find the Softaculous icon and click it. Click on WordPress icon. It should be on the very first page of Softaculous. Choose Protocol – Choose protocol for your WordPress site. If you have SSL installed, it’s highly recommended to install WordPress on HTTPS protocol. Choose Domain – If you have subdomains or add-on domains in your cPanel, you can select them here. In Directory – Enter WordPress installation directory. If you want to install WordPress on root domain name, leave it empty. Site Name – Enter the name for your WordPress site. Site Description – Your WordPress site description goes here. Enable Multisite – Choose whether or not to enable WordPress Multisite. This feature allows creating multiple WordPress sites using the same WordPress installation. Admin Username – Choose the username for your administrator account. Admin Password – Password for your WP administrator account. Admin Email – Enter your email address here. Be sure to enter a working email as it will be used to send notifications and password reset requests. Select Language – WordPress supports a lot of languages. Choose your language here. Select Plugins – Choose plugins you want to pre-install. Press Install button and Softaculous will begin installing WordPress. Upload WordPress files using cPanel’s File Manager. Run WordPress 5-minute installation wizard. The latest version can be downloaded from the official page here. Click Download WordPress button in order to start the download. Save .zip archive to your computer. You will need it in the next step. Access cPanel and open File Manager. Open public_html directory and press Upload button. Press Select File and choose WordPress .zip archive you have downloaded in the first step. Once the upload is completed status bar will turn green. Press Go Back to “/home/username/public_html” button. Select .zip archive, press Extract button and Extract File(s) to proceed. WordPress files are in the folder named wordpress. Unless you want to access your blog via http://yourdomain.com/wordpress you need to move WP files to the public_html directory. In order to do so, access wordpress folder, select all files and click on Move button. Delete wordpress from file path that you want to move files to and press Move File(s) button. Finally, select wordpress folder and .zip archive while holding the SHIFT key and press Delete button. Head to cPanel and click on MySQL Database Wizard icon. Enter the name for your MySQL database. On this step enter username and password. It’s recommended to use Password Generator tool as it’ll generate random, secure password for you. Once you are done, hit Create User button. You would want to assign all privileges for your user. Select ALL PRIVILEGES and click on Next Step. That’s it, MySQL database along with the user has been created successfully. IMPORTANT: Write down MySQL database credentials. You will need them in the next step. Choose preferred language and press Continue button. On the next screen, you will be asked to gather all required information for manual WordPress installation. You can proceed and press Let’s Go button since you already have everything you need. Now enter information of the MySQL database you created in Step 3 and press Submit button. WordPress will check if MySQL credentials are correct. Press Run the install. On the next screen, you will be asked to enter your blog and administrator account details. Enter all required details and press Install button. It is strongly recommended to enter your real email address as it will be used to reset WordPress admin area password in case you lose it. Congratulations, you have just manually installed WordPress. 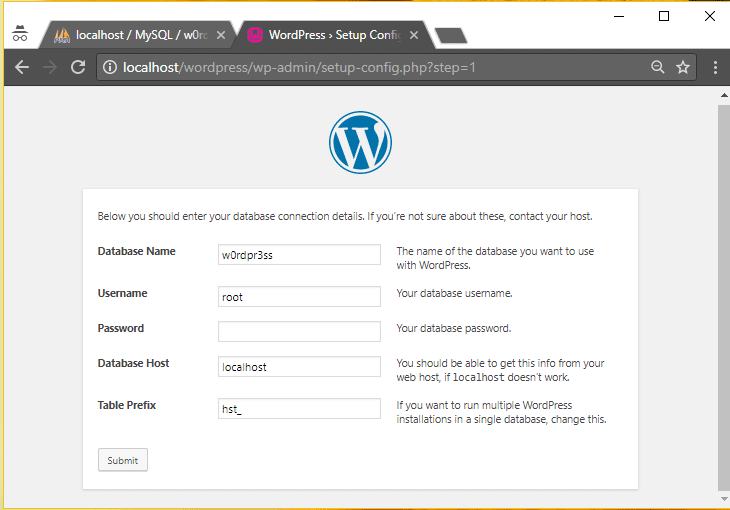 If you have a VPS running Ubuntu 16.04 and you need a quick, resource-efficient way to create a blog, installing WordPress is the best way to do so. VPS is particularly useful if your web site receives heavy traffic, or has many web pages that require additional resources. You will also need an SSH client to connect to your VPS and nano text editor to edit WordPress configuration files. 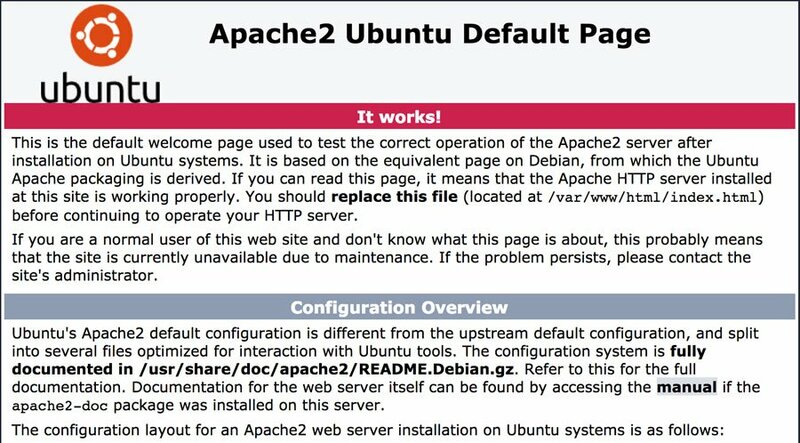 You should see default Apache2 page. Hit CTRL+O to save the file. Then press CTRL+X to exit. Now visit the link http://server_address/test.php. You should see the words “This is a test” on the screen. If you see the message, then your PHP installation was successful. You will be asked to set the root (administrator) password for managing databases. Enter a strong, secure password and press ENTER to continue. It is recommended that you secure your installation before proceeding. Executing the command below will install certain plugins (including the validate_password plugin). Answer Y (Yes) for all questions except the one which asks you to whether you want to change the root password. Enter N (No) for this question and hit ENTER. Now, we must move the folder to the Apache Server directory. with the required settings for your database name, MySQL username, and password. Please note that these must match what you set earlier (db_name , db_user and db_user_password). Open your browser and visit your server address. You should be greeted with the famous WordPress 5 minutes install screen. Now simply provide required details and complete WordPress installation. Congratulations! WordPress is set up on Ubuntu 16.04! If you install WordPress locally, you will have an awesome testing environment. It will let you test out any changes instead of trying them on your live website. Or perhaps you are a beginner at the web hosting world and wish to learn more about the CMS. Whatever the case, setting up WordPress locally can bring many benefits. Let’s see how we can achieve it! 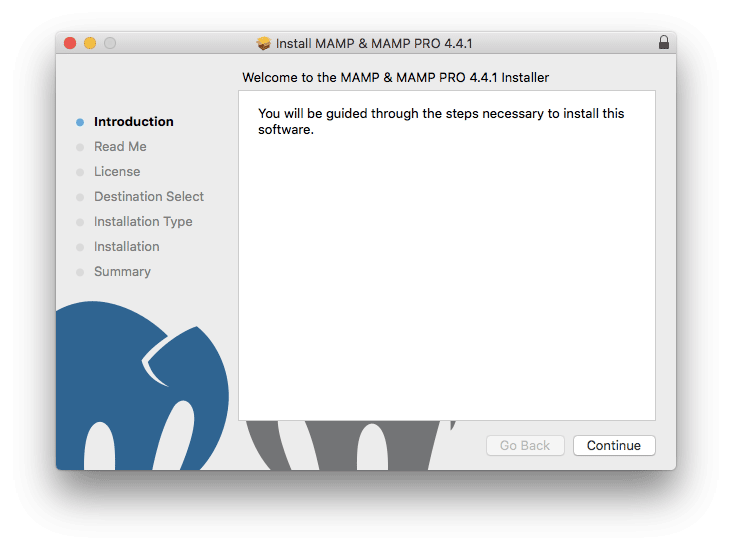 To install WordPress locally on a Mac, we’ll be using MAMP. It is short for Macintosh, Apache, MySQL, PHP. This tool allows you to start a local PHP and MySQL server. In short, it provides all the necessary ingredients to run a test WordPress environment on your local machine. There are other ways to install WordPress locally, but using MAMP is the simplest and most efficient one. 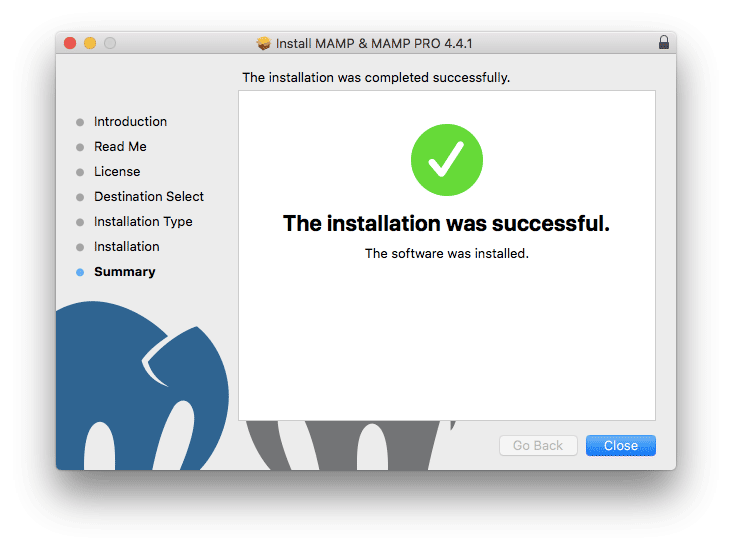 First, download and install MAMP on your Mac. 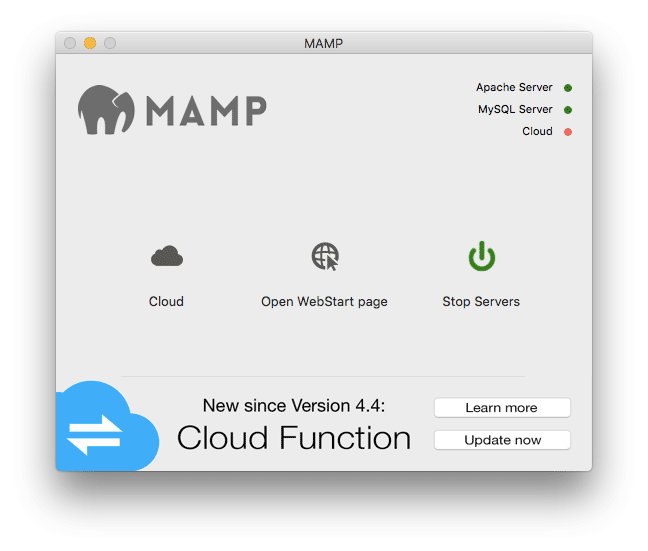 For this example, we’ll be using MAMP version 4.4.1. The installation wizard is quite simple and does not require any custom settings. Proceed until the setup is complete. Next, let’s set up the software. To make it simpler, we will be using the default ports and settings MAMP provides. At this point, we only need to create a database. To do that, open MAMP and click Start Server. Once it finishes, select Open WebStart page. Navigate to Tools-> phpMyadmin section. 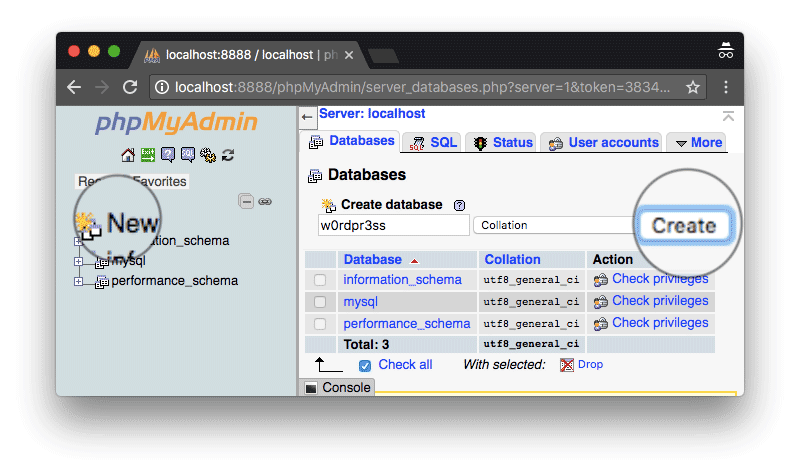 Once phpMyadmin opens, click New and create a database for WordPress. In this example, we will use w0rdpr3ss. That’s it! We’re ready to begin setting up WordPress locally. To install WordPress, download the latest version and extract it. The default MAMP document root is Applications/MAMP/htdocs. This is where you will need to place the WordPress files. You can then access the WordPress installation wizard by entering localhost:8888 in a browser. Database name – the value you created in step 2. In our case, it is w0rdpr3ss. Table Prefix – by default this value is wp_. But you can change it for security reasons. 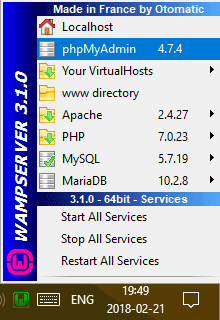 To install WordPress locally on Windows, we will utilize WampServer. It’s short for Windows, Apache, MySQL, PHP. And it’s the perfect tool set up WordPress on a local Windows machine. First download and install WampServer on your computer. The wizard is pretty simple and no custom configuration is needed, so you may proceed until it finishes. You’ll only be prompted to choose the default browser and text editor that WampServer will use. 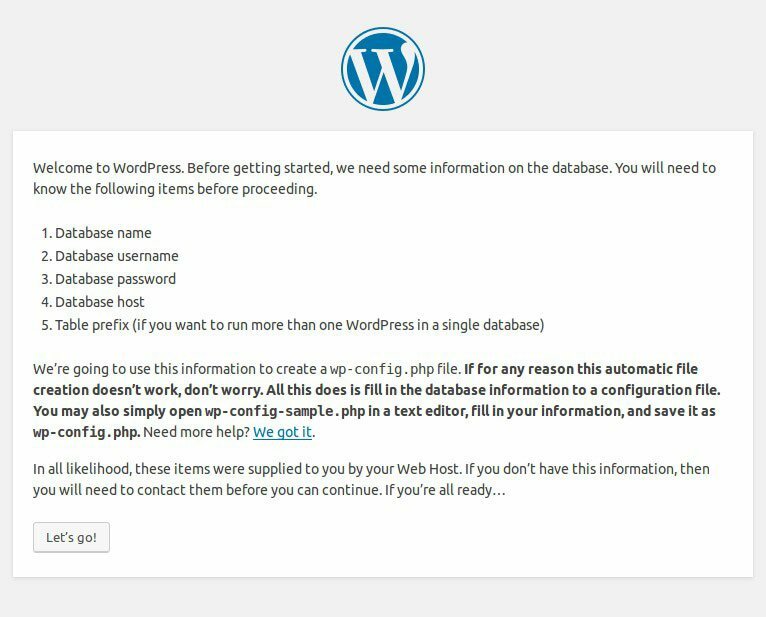 Before proceeding to install WordPress, we’ll need to create a database. 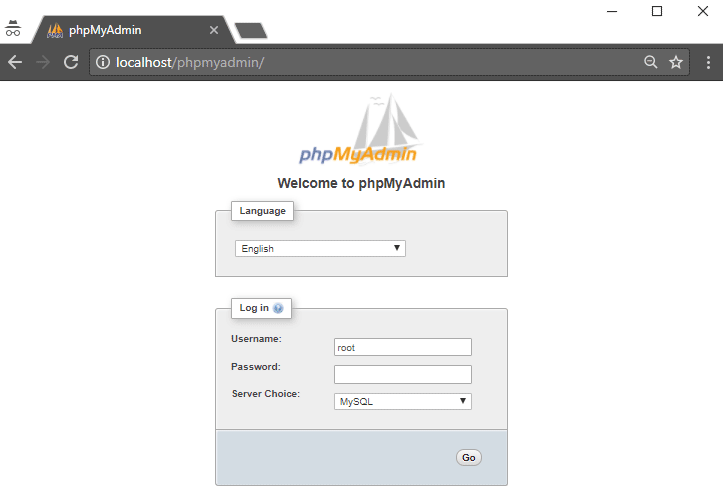 Access WampServer from your taskbar and launch phpMyadmin. Navigate to Databases section and create one for your WordPress site. That’s it! We’re ready to set up WordPress. Start the WordPress installation by downloading the latest version. Upload and extract it to C:/wamp64/www directory on your computer. The mentioned folder is your document root. Once the extraction is complete, you are ready to install WordPress. Open your browser, enter localhost/wordpress and you’ll be able to choose your language. On the next step you’ll be prompted with the database details. Database name – input the name you created in step 2. For our demo, we used w0rdpr3ss. Password – leave this field empty. Table Prefix – the default setting is wp_. You may change it for security reasons. Then, complete the remaining steps and you’ll have WordPress available on your local Windows machine. Now that you’re done with the WordPress installation, the real fun begins. Installing WordPress is only the first step in your journey as a web owner, and a flurry of opportunities await you ahead. As part of the WordPress philosophy, you are free to customize your website in a variety of ways. Whether you are on the look-out for quality third-party plugins to make your site more robust, or want to overhaul the look and feel of your site, you won’t be left disappointed at the number of options available. A good place to start your WordPress website’s customization is choosing a theme for it. Selecting an appropriate theme for your site is critical. And while the default WordPress theme is not the worst option, you’d want a more suitable choice according to the content of your site for maximum user retention. It will also let your users know that you pay attention to detail – a quality that will make your site stand out in a sea of other options. Luckily, a popular feature of WordPress’ thousands of free and premium themes. The easiest way to install new themes is via the official WordPress Theme Directory. Here, you can browse for your free themes, and quickly add it to your site through simple steps. To do so, simply go to your WordPress admin panel, and go to the Appearance section. You should be taken to the Themes page – click on the Add New button. 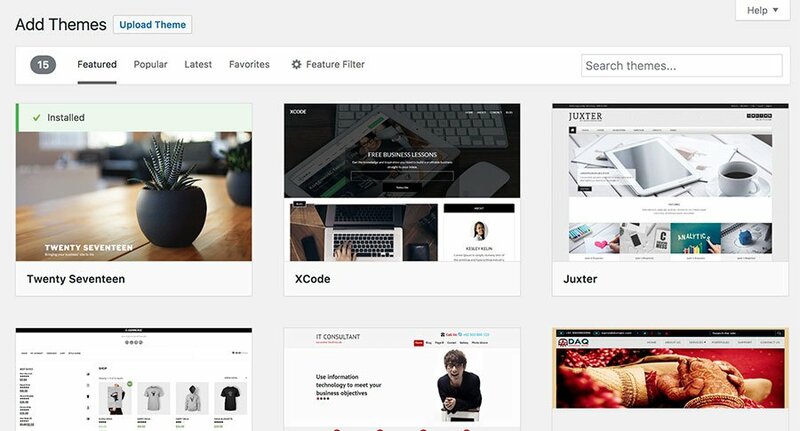 Now search, download and install a new WordPress theme. For a more detailed look at installing WordPress themes, follow this tutorial. In addition to getting your website a classy look, you may also be tempted to add more functionality to your site. While WordPress is fairly feature-rich out-of-the-box for a standard content management system, it is far from ideal if you want to squeeze every bit of juice out of the framework. Plugins are extensions for your WordPress site, that could be used for a number of reasons. Whether you are looking for more control in the admin panel, better SEO optimization, better site stats and analytics, speeding up website performance or enhancing your site’s overall functionality, there is a plugin waiting for you in WordPress’ Plugin Directory. Similar to installing new themes, the simplest route to installing plugins is through the admin panel. In the dashboard area, choose Plugins, and press the Add New button. We also have a step-by-step guide on installing WordPress plugins, which is worth checking out. but from where and how to Run WordPress 5-minute Installation Wizard? i am installing wordpress mannuly but where and how to Run WordPress 5-minute Installation Wizard? If you have uploaded WordPress files, access your domain name via browser. You should be presented with WordPress five minute install. how to Run WordPress 5-minute Installation Wizard?